Let me begin by saying, this games was everything but entertaining. As I stated in yesterday’s article, I expected the two stars Angel McCoughtry and Ivory Latta to lead their team in a competitive battle. Well Latta and team came to the Phillips Arena to play, McCoughtry and the Dream not so much. Latta led her team in scoring, shooting 50% from the field on six of twelve shooting for 14 points and 7 assists. The Mystics produced a balanced attack on the Dream. McCoughtry also led her team in scoring with 20pts,4rebs,3asts,1stl but it wasn’t her best shooting night shooting 6-20 from the field. Boy was I wrong about the Dream winning Game 1 and controlling the series, the Dream struggled to put points on the board the entire game. Hopefully the Dream will pull it together before Game 2 Saturday so they can avoid elimination and take the series back to Atlanta tied 1 – 1. I haven’t given up hope just yet, I still believe that the Dream will win the series 2 – 1. Hopefully they will rebound from their loss. McCoughtry has had a great season thus far, I would hate for it to be over so quickly, not to mention so easily. On the day Candace Parker was named league’s Most Valuable Player, many thought it was motivation enough for her and the Sparks to come out aggressive. I felt that in order for the Sparks to win this series Parker and Nneka Ogwumike must play like stars. Well Parker showed up, I have officially filed a missing person’s report on Ogwumike. Parker’s MVP night was spoiled by a very talented White Mamba in Diana Taurasi (30pts,4rebs,7asts) and an assertive Mercury squad. This game was entertaining and had many ups and downs unlike the Mystics/Dream game before it. 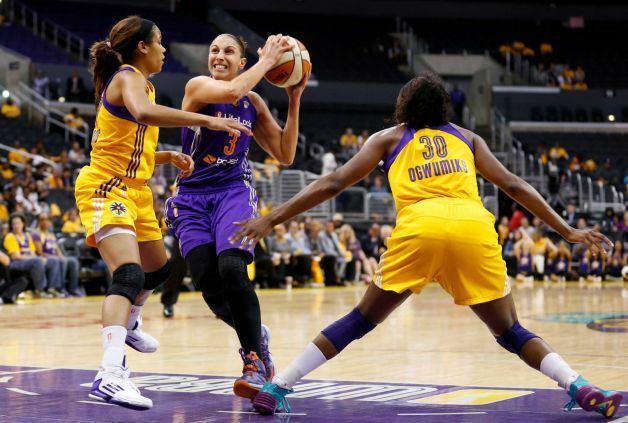 The Sparks were only down by five points at halftime 43-38 but the Mercury found the net more and dominated more. The runs put on by Taurasi in the second half was unbelievable, scoring 14 points in the third quarter. We were reminded just how talented she is. Parker finished the game with 28pts and 8rebs, in front of a many spectators and celebrities on hand. I look for the Sparks to learn from their Game 1 mishaps and even the series on Saturday.